There was once a time when a workplace would be constricted to the office but nowadays it’s a different story. Advancements in technology mean that freelancers and employees alike can work almost anywhere, and still have access to the information they require immediately. ShowMyPC offers services for Remote Access and Collaboration that break all geographical barriers, and connect anyone anywhere in the world. 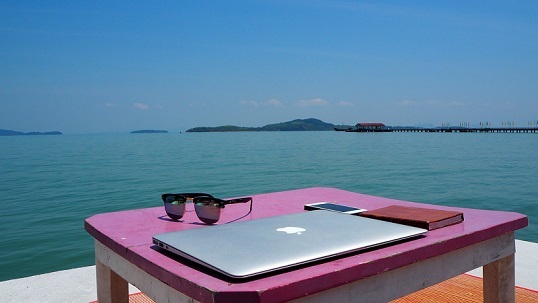 As such, more and more professionals can seek out new opportunities that may not have been possible before, but what are the real benefits of remote working? Recent statistics show that 73% of remote workers have started in the last four years, with 80% hoping to continue working remotely. There can be many reasons as to why people set their sights on remote working but can often be attributed to the following reasons. The daily commute is something many of us endure, but there is a simpler way. Although there may be a requirement for you to attend the office in some instances, remote working allows you to cut out the commute and focus on the task at hand. A long commute is also the reason why 23% of employees end up looking for a role elsewhere. This means that less time is being used for travelling, which not only means projects can be completed sooner but the company employing the services of a remote professional can also save on expenses as there will be little need for travel. Of course, the hours you need to dedicate to a role can depend on the nature of the project, but in most instances, workers that use remote access for online collaboration find that they’re able to free up more time than if they were working in an office environment. As well as allowing for more flexibility, the use of remote working has also shown that employees are likely to put in more effort than those based in a fixed office. Although many will work solo on some projects, there will be those who need to communicate with others in order to complete a project. This often means having access to information in real time, and while email can be beneficial, there is still an element of delay. Because of the flexible nature of remote access, online collaboration is easier and more productive, as there are no obstructions when it comes to viewing new updates in relation to the project. Given that remote working allows professionals to work in real-time regardless of their location, remote working as a team has also seen a surge in popularity among professionals and businesses. Many would be forgiven for thinking that the office is the most productive place in the world, but there can be several things that cause distraction when in the office. Whether it’s ringing telephones or animated conversations, there can be a series of occurrences that means that focus isn’t on the job at hand. However, remote working allows employees and freelancers to work in more tranquil surroundings, ensuring that there are no distractions nearby. Even if a problem should arise, using ShowMyPC allows workers access to remote PCS as well as enable seamless online collaboration using screen sharing to ensure that there are no unnecessary delays when completing a project or meeting an important deadline. Recent statistics show a massive surge in productivity when businesses allow employees to work from home, and there is little to worry about in the way of support as long as the right application is used. There’s no denying the importance of maintaining a professional image, and wearing clothes that portray a professional image is the best way to do this. However, having to maintain this image daily can be expensive. Remote working allows employees and freelancers to wear what they want. Although it may not be the most alluring benefit of working from home, it’s certainly something worth considering if you’re looking to raise your bottom line. This is a mere overview of the benefits that remote working can offer, and while some businesses may need to employ the solution in different ways, remote working allows talented individuals and companies to make an easy partnership and maintain a long working relationship.